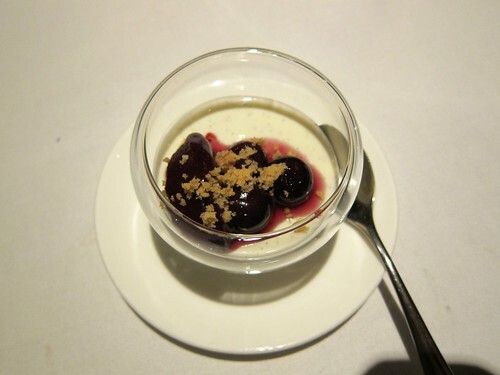 The Ledbury is located in Notting Hill, and takes a little tube and walk to be reached, which is a good thing, because you can’t have enough appetite at this restaurant. We followed a recommendation of Felix who is a well known regular of the place and of course a reliable source for food-wise information. Naturally, we opted for the tasting menu but with a slight tilt, since we asked to add the scallops course as a starter. 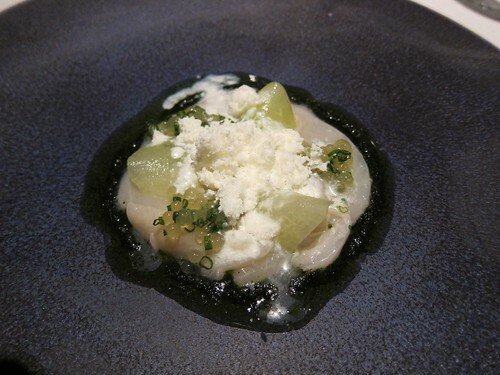 Ceviche of Hand Dived Scallops with Seaweed and Herb Oil, Kohlrabi and Frozen Horseradish. The scallops were of ultra fresh quality, up to the standards of the worlds most reknown Sushi chefs. A refreshing starter with the frozen horseradish and an original combination of flavours although I couldn’t describe them any further now. A very creative and good dish. Flame Grilled Mackerel with Cured Mackerel, Avocado and Shiso. Somehow I can’t remember how exactly this dish tasted. But if you put it in front of me now, I’d eat it again for sure. 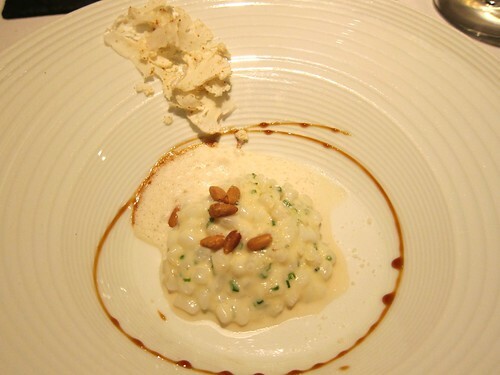 “Risotto” of Squid with Pine Nuts, Sherry and cauliflower . It is a Risotto where rice is simulated by small bits of very tender squid. The sauce was yummy and hearty thus this dish played the soulfood role in the menu. Very good and heart-warming dish. It actually reminded me of a “Pesto Spaghetti” dish at Varoulko in Athens where spaghetti were simulated by thin slices of squid, equally tender! 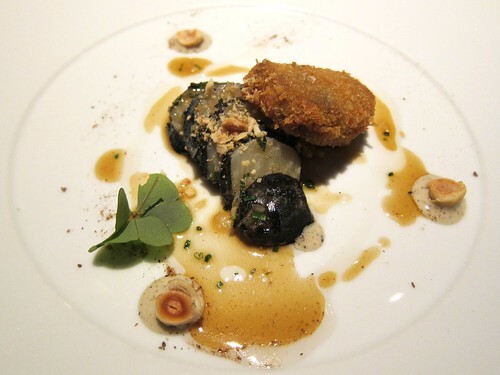 Celeriac Baked in Ash with Hazelnuts and a Kromeski of Wild Boar. Interesting combination with flavours from the earth. Slightly sweet earth flavours amanating from the celeriac. The piece of wild boar seemed a little too greasy though with its deepfried breadcrumbs. 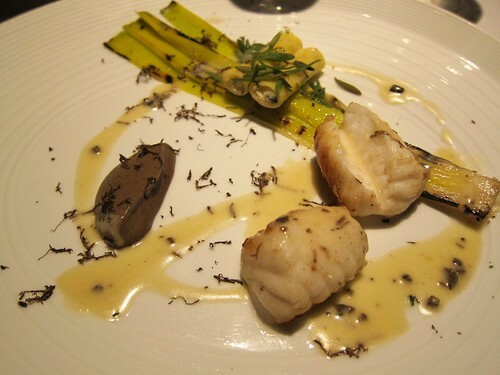 Roast Monk Fish with Grilled Leeks, Hand Rolled macaroni and Truffle Purée . Usually this dish is made with Cod, but for tonight they replaced it with monk fish. The Monk fish was of excellent quality: tender and juicy, yet with typical bite to it. This dish was characterized by surf and turf notes with smoky flavours from the grilled leeks and earthiness coming from the truffles. Satisfying dish. Pyrenean Milk Fed Lamb with Baked Jerusalem Artichokes and Winter Savory Milk. Again what product quality! The meat was nearly melting on your palate. The accompanying wine – a 1997 Sarget de Gruaud Larose, Saint-Julien – was a perfect match, and such a great wine for this average or “classic” vintage. Very Good. Speaking of wine, The Ledbury more generally has a very interesting wine list with good variety and bottles for every budget. 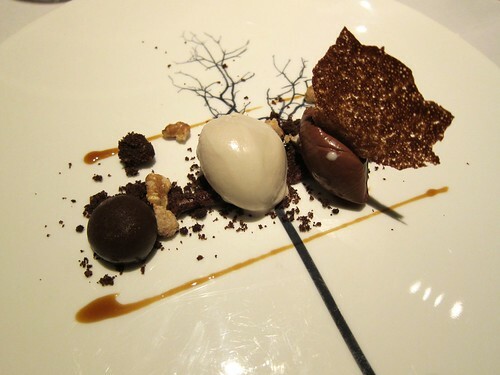 Chocolate Cremeux with Walnut Ice Cream and Warm Chocolate Madeleines. Good Chocolate variations- very nice presentation. Always hard to impress with desserts though. 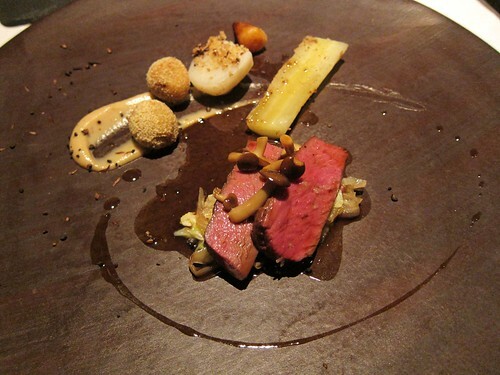 It was a enjoyable evening at The Ledbury with food on a really high level. In particular the product quality was impressive. Same for the flawless execution of the cooking. Not one bit was overcoooked, none was too raw. The combination of flavours is another chapter. 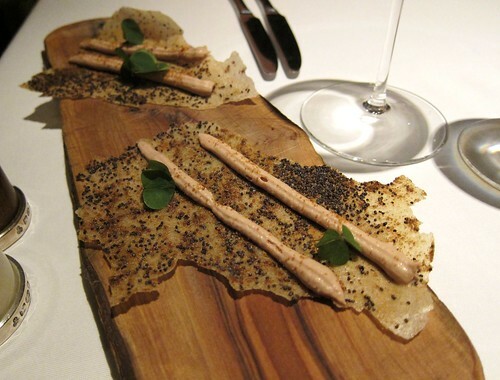 The creativity is undeniably high but the flavour combination seem sometime quite subtle and require lots of attention. Are they always seizable and do they work? 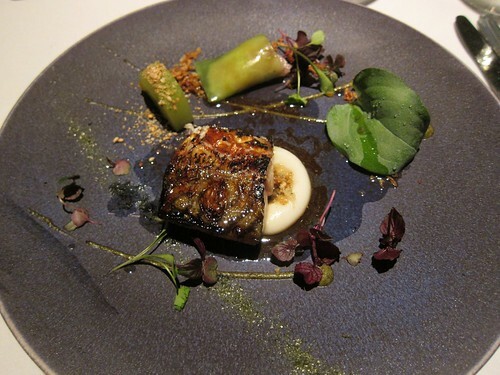 For example: I couldn’t sense the added value of the shiso with the flamed mackerel. Also I think the presentation seemed a bit too random sometimes and not self explaining enough. A less artsy and more linear arrangement of ingredients and flavours on the plate could add a lot to the experience I believe. In the sense that you’ll have a proper bound book instead of a bunch of orderless pages – thus a better understanding of the Chefs message. But this is critique on a high level: I totally agree with the 2 star rating of the restaurant in every domain. In fact, what I also appreciated a lot, was the not so buttoned up atmosphere of the restaurant, and the charming and very advertent staff. P.S. Opportunity to change to Mac ;) It changed my life when i did that. Thanks Aiste. Mac is a possibility of course. Just not sure if I feel like changing a complete mentality right now. BTW, you won’t be in NY by any chance those next 2 weeks?